LYNX Rapid RPE Anitbody Conjugation Kit® enables the rapid conjugation of a pre-prepared lyophilized mixture containing R-Phycoerythrin (RPE) label to an antibody or protein. Activation of proprietary reagents within the antibody-label solution results in directional covalent bonding of RPE to the antibody. Due to the large size of RPE (240kDa), it is recommended that 50-60ug of antibody be used for every 100ug RPE, to ensure a slight RPE molar excess. For optimal results the antibody should be at a concentration of 1mg/ml, with a maximum volume of 60ul and a maximum antibody amount of 60ug. Antibody at a concentration of greater than 1mg/ml requires dilution. Antibody below 1mg/ml can still be used as long as the maximum volume is not exceeded. Using less than the recommended amount of antibody may result in unbound label, but this will be removed during subsequent application wash steps. Antibody below 0.5mg/ml should be concentrated before use with the kit. Due to the large size of RPE (240kDa), the quantity of RPE is in slight molar excess. Approximately 10ug of IgG will give a 1:1 molar ratio of antibody:RPE. For optimal results the antibody should be at a concentration of 1mg/ml, with a maximum volume of 10ul and a maximum antibody amount of 10ug. Antibody at a concentration of greater than 1mg/ml requires dilution. Antibody below 1mg/ml can still be used as long as the maximum volume is not exceeded. Using less than the recommended amount of antibody may result in unbound label, but this will be removed during subsequent application wash steps. Antibody below 0.5mg/ml should be concentrated before use with the kit. Due to the large size of RPE (240kDa), it is recommended that 50-60ug of antibody be used for every 100ug RPE, to ensure a slight RPE molar excess. For optimal results the antibody should be at a concentration of 1mg/ml, with a maximum volume of 600ul and a maximum antibody amount of 600ug. Antibody at a concentration of greater than 1mg/ml requires dilution. Antibody below 1mg/ml can still be used as long as the maximum volume is not exceeded. Using less than the recommended amount of antibody may result in unbound label, but this will be removed during subsequent application wash steps. Antibody below 0.5mg/ml should be concentrated before use with the kit. Store kit at -20oC only. Newly-conjugated antibody can be stored at 4oC. For long term storage however, the addition of a preservative is recommended. Storage in frost-free freezers is not recommended.This product should be stored undiluted.Avoid repeated freezing and thawing. 1. To the antibody sample add 1ul of the Modifier reagent for every 10ul of antibody and mix gently. 2. Pipette the mixed antibody-modifier sample directly onto the LYNX lyophilized mix and gently pipette up and down twice to resuspend. 3. Replace cap onto vial and incubate in the dark at room temperature (20-25oC) for 3 hours, or overnight if preferred. 4. After incubation, add 1ul of Quencher reagent for every 10ul of antibody used. Leave to stand for 30 minutes before use. Li, X. et al. (2010) Design of a potent CD1d-binding NKT cell ligand as a vaccine adjuvant. Proc Natl Acad Sci U S A. 107: 13010-5. Campbell, J.E. et al. (2010) Cellular regulation of blood coagulation: a model for venous stasis. Tighe, R.M. et al. (2011) Ozone Inhalation Promotes CX3CR1-Dependent Maturation of Resident Lung Macrophages That Limit Oxidative Stress and Inflammation. J Leukoc Biol. 84: 1511-20. Hofer, C.C. et al. (2015) Infection of Mice with Influenza A/WSN/33 (H1N1) Virus Alters Alveolar Type II Cell Phenotype. Am J Physiol Lung Cell Mol Physiol. ajplung.00373.2014. Welinder, C. et al. (2015) Cytokeratin 20 improves the detection of circulating tumor cells in patients with colorectal cancer. Shive, C.L. et al. 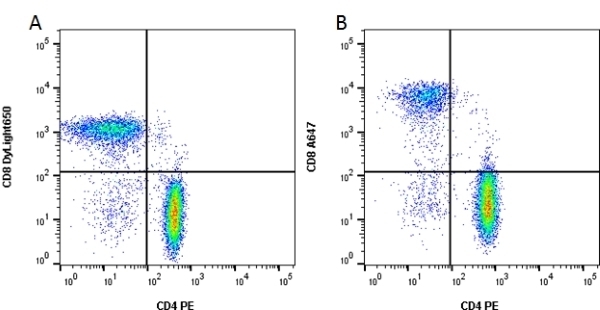 (2014) Inflammatory cytokines drive CD4+ T-cell cycling and impaired responsiveness to interleukin 7: implications for immune failure in HIV disease. J Infect Dis. 210: 619-29. Huang, L. et al. (2015) c-Jun gene-modified Schwann cells: upregulating multiple neurotrophic factors and promoting neurite outgrowth. Tissue Eng Part A. 21 (7-8): 1409-21. Hofer, S. et al. (2016) RAGE-mediated inflammation in patients with septic shock. J Surg Res. 202 (2): 315-27. Attatippaholkun, N. et al. (2017) Dengue Virus and Its Relation to Human Glycoprotein IIb/IIIa Revealed by Fluorescence Microscopy and Flow Cytometry. Viral Immunol. Sep 25 [Epub ahead of print].